SOMERVILLE -- On a windy day where scoring chances were limited, the #5 Amherst College Lord Jeffs came away with a 1-0 victory over the Tufts University Jumbos in NESCAC women's soccer action Saturday afternoon at Kraft Field. 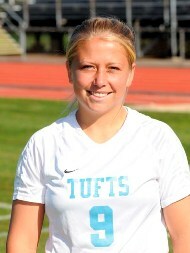 The match entered the second half scoreless, but Tufts had chances in the first half including a shot that went wide left off the foot of senior Cara Cadigan (Nahant, MA) in the 27th minute. Amherst led in the shot department after the first half due to a late flurry, 5-4. The Lord Jeffs would strike with the lone goal of the contest in the 52nd minute when the initial shot from junior Kyla Woodhouse (Topsham, ME) was saved and deflected to the right by Tufts senior keeper Kate Minnehan (Hopkinton, MA). Junior Jackie Hirsch (Wilmette, IL) pounced on the loose ball and deposited it into the back of the net to give Amherst the 1-0 lead. Tufts had an opportunity to tie the match up in the 70th minute with the Amherst keeper, sophomore Allie Horowitz (Woodbridge, CT), out of position, but the back line of the Lord Jeffs defense was able to clear the ball away to keep it 1-0 in favor of Amherst. Both Minnehan and Horowitz went the full 90 minutes for their respective clubs. Minnehan made seven saves on ten shots from Amherst. Horowitz stopped six of ten shots in shutting out the Jumbos. Amherst has yet to allow a goal in its first two games this year. This is the second consecutive victory for Amherst over Tufts after having not earned a win over the Jumbos since 2001. Amherst is now 2-0 in the NESCAC and 2-0 overall, while the Jumbos fall to 0-2 in conference play and 1-2 overall. Tufts takes on non-conference foe Wheaton at Kraft Field on Wednesday afternoon at 4:30 pm. Amherst is at Skidmore tomorrow for a 2 pm contest.